Normally, all of these components work in harmony. But disease or injury can disrupt this harmony, resulting in pain, muscle weakness, and reduced function. 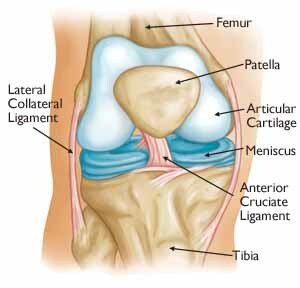 Learn more about Knee Anatomy here. A knee replacement (also called knee arthroplasty) might be more accurately termed a knee “resurfacing” because only the surface of the bones are actually replaced. 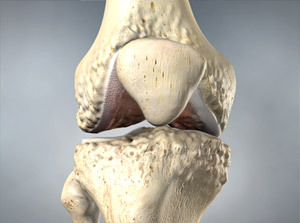 There are four basic steps to a knee replacement procedure. The decision to have total knee replacement surgery should be a cooperative one between you, your family, your family physician, and your orthopaedic surgeon. Your physician may refer you to an orthopedic surgeon for a thorough evaluation to determine if you might benefit from this surgery. > A graduated walking program to slowly increase your mobility, initially in your home and later outside. > Resuming other normal household activities, such as sitting, standing, and climbing stairs. > Specific exercises several times a day to restore movement and strengthen your knee. You probably will be able to perform the exercises without help, but you may have a physical therapist help you at home or in a therapy center the first few weeks after surgery. Follow your orthopedic surgeon’s instructions carefully to reduce the risk of blood clots developing during the first several weeks of your recovery. He or she may recommend that you continue taking the blood thinning medication you started in the hospital. Notify your doctor immediately if you develop any of the following warning signs. > Participate in regular light exercise programs to maintain proper strength and mobility of your new knee. > Take special precautions to avoid falls and injuries. If you break a bone in your leg, you may require more surgery. > Make sure your dentist knows that you have a knee replacement. You should be given antibiotics before all dental surgery for the rest of your life. 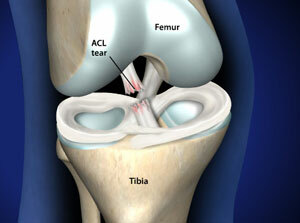 > See your orthopaedic surgeon periodically for a routine follow-up examination and x-rays, usually once a year.